Panic disorder is characterized by repeated and unpredictable attacks of intense fear and anxiety. 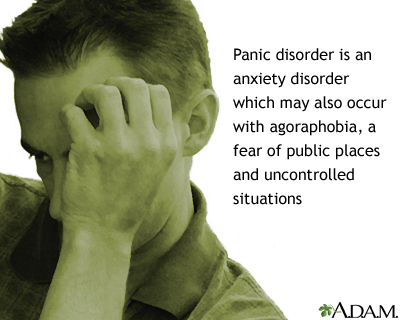 Agoraphobia, literally "fear of the marketplace", develops from a panic disorder in more than one-third of cases. Reviewed By: Fred K. Berger, MD, addiction and forensic psychiatrist, Scripps Memorial Hospital, La Jolla, CA. Also reviewed by David Zieve, MD, MHA, Isla Ogilvie, PhD, and the A.D.A.M. Editorial team.